Paytm – Get 100% Cashback on your Bus Ticket Booking (Max cb Rs 200 – 2 Times). 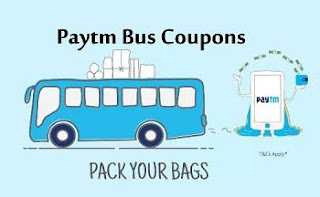 Paytm has come up with awesome deal on Bus Ticket Booking where they are offering Flat 100% Cashback on Bus Ticket Booking for All Users. No minimum Bus Ticket booking. Maximum cashback is Rs 200. So Hurry up !! Get 100% Cashback up to ₹200 on bus ticket booking. Offer is valid only twice per user. Also share the post on your Facebook or Twitter handle and stand a chance to win Free roundtrip flight ticket to Thailand. One Lucky Winner will be eligible for 100% Cashback upto ₹30,000. Voucher is valid on roundtrip booking to Thailand. The voucher is valid only for one-time usage per user. The winner selection will be at the sole discretion of Paytm. The winner will be announced by 6th March 2019. Voucher is valid till 7th April 2019. Paytm reserves its absolute right to withdraw and/or alter any terms and condition.